After the failure of my first PCR, we tried again. This one is more successful. Of my 7 samples, 5 amplified. We aren’t sure why the other two didn’t, so I’m going to try to re-extract DNA from them and try a few different primers with them this week. 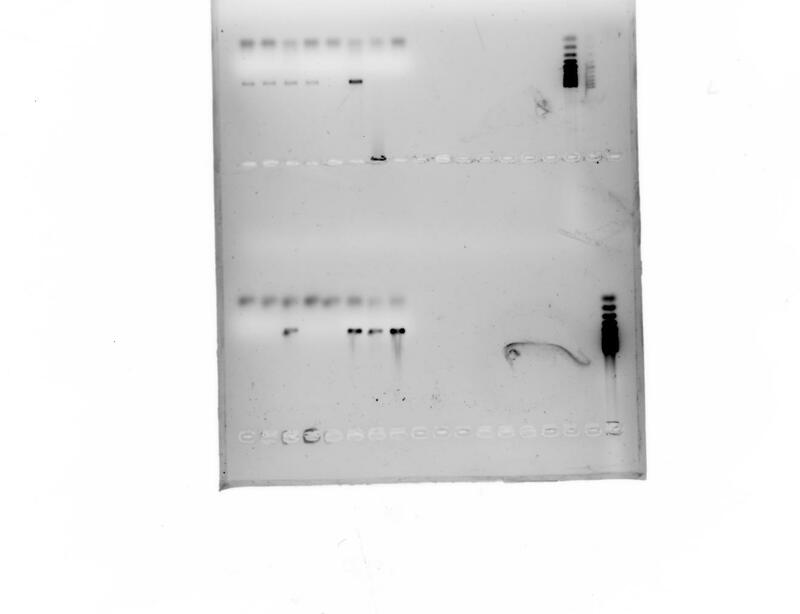 The samples that started from the middle of the gel are mine. #’s 1, 2, 3, 4, and 6 amplified. 5 didn’t do anything, and 7 is doing something weird. Note that the ladder is visible now since the gel was made properly. The samples that started from the bottom of the gel are another student’s. Andrew? Kevin? Other PCR-0-philes? What’s going on with sample #7? It’s lit up as if there is some DNA there, but it didn’t move through the gel at all. Maybe something happened with your primers for #7 and the strands just kept replicating along the same strand? Just a suggestion. I’m by no means a PCR expert. I can just do the process. Couldn’t explain it well at gunpoint.